Samantha Taylor is the next witness up. She met Oscar in 2010 at a rugby game. They began communicating on social media and then started dating in 2011. She was 17 at the time. While they were dating, she spent an average of 4 days per week at his home. Oscar slept on the right hand side of the bed (if standing up looking at the bed). This is the side closest to the balcony. 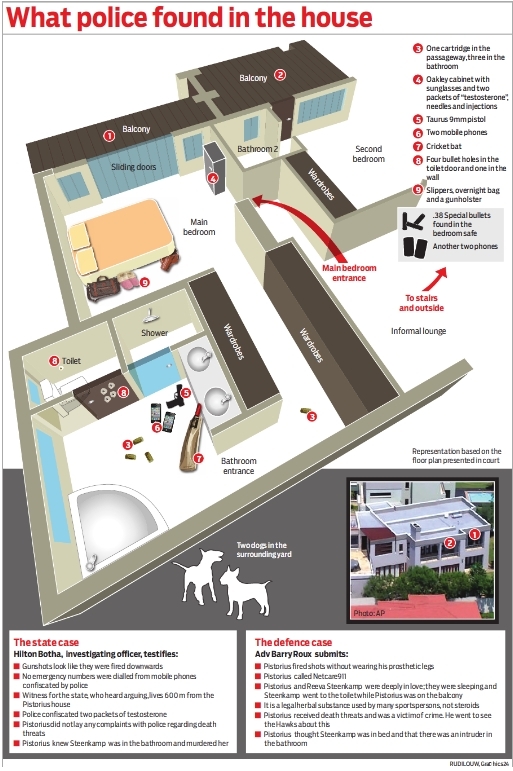 Note in the picture below, police found the gun holster on the other side of the bed next to Reeva’s slippers and overnight bag (which somewhat implies that the left side of the bed was hers). Samantha states that Oscar did own a gun at the time they were dating. He kept it on him at all times. At night, he slept with the gun either on the bedside table next to him or next to his legs on the floor. Oscar had 2 cell phones while they were dating, one for work and one for personal use. He used his phones frequently including at night. She estimated that he would use the phone approximately 4-5 times in bed each night. Not for voice calls, but for other things such as messaging. He also used his iPad frequently. She also testified that she has heard Oscar scream, and has witnessed him being very anxious, and he never screamed like a woman. He sounded like a man. One time they went to the Vaal River with friends. Oscar, Samantha and Darren Fresco were in one car. Justin Devaris and Sam Greyvenstein in another car. While they were driving home that day they were stopped by the police for speeding. The policeman asked Oscar and Darren to get out of the car. Oscar left his gun on the seat. When the policeman saw the gun on the seat, he told Oscar that it could not just be left there. The policeman cocked the gun and the bullets fell out in to the car. Oscar got very angry and shouted at the policeman and told him he was not allowed to touch his gun. Afterwards, they put the gun back together and left. Oscar and Darren were irritated with the policeman and they laughed and said they wanted to shoot a robot (traffic light). Shortly later, Oscar then shot a bullet out of the open sunroof with his gun. Both Oscar and Darren laughed. Darren was driving at the time. Oscar was in the passenger seat. Samantha was in the backseat behind Oscar. Nobody discussed the incident after. From there, they went to sign gun papers over at a friend of Oscar’s house. Samantha could not recall where this friend’s house was, although she does remember the details of the home very well. They went to dinner afterwards in Sandton. In addition to Oscar yelling at Samantha on occasion, she also witnessed him yelling at her sister, her best friend and Oscar’s best friend Alex. On these occasions, he did not scream like a woman according to Samantha. Samantha said their relationship ended because he cheated on her with Reeva Steenkamp. At this point she becomes emotional and they take a short break from testimony. Roux cross-examines when they come back. He tells Samantha that he will provide emails from Samantha that prove she and Oscar were broken up when Oscar first went out with Reeva. According to Samantha, the first time their relationship ended was when he cheated on her with a woman named Anastasia while he was on a trip in New York. The second time their relationship ended was November 4, 2012, when Oscar took Reeva to the sports awards. Roux disputes that they were still in a relationship at that time. Samantha testifies that a week prior they were in Sun City and did have issues at that time. Over the course of that week there was a lot of commotion in their relationship, but they had not broken up. During that time she sent Oscar an email but does not elaborate on the contents. Roux hints that he will be bringing that in to evidence at some point but does not produce it now. Samantha confirms that at the time of their relationship, she was living in Johannesburg. She also confirms that in Oscar’s bedroom at night time when the lights are off and the curtains are closed, it is dark. But she did state that Oscar would usually keep his curtain cracked a little bit because he would get up to train at 5am. Roux wants to know more about the times when Samantha witnessed Oscar screaming. Samantha says he was mostly screaming when he was angry. Roux points out that these were angry situations and not situations of a life-threatening nature. Implying that the tone of his voice would be different. Roux states that according to Darren Fresco’s statement, the incident in the car with the sunroof was on September 30, 2012. Roux asks her how long was it after they were pulled over by police that Oscar shot the gun. She states approximately 15 minutes. Afterwards, they went to a friend’s house to sign papers for guns. She can’t remember where exactly this house was and Roux is questioning her memory. Afterwards they went to a burger place in Apple Square in Sandton. 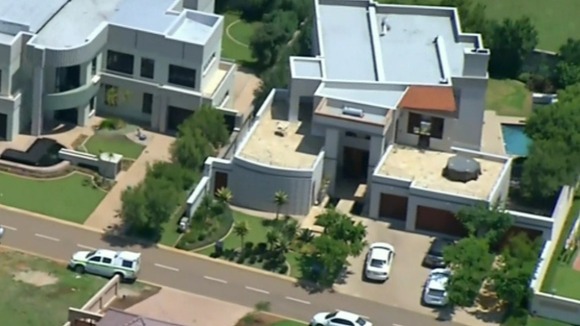 From there, they went back to Justin Devaris’ house where Oscar’s car was parked. It was evening. She and Oscar went home and she believes she may have spent the night. Roux asks Samantha how well she remembers the incident, and she says she remembers it well. He brings up that Oscar and Darren were laughing at the time of the shot, and Oscar didn’t actually shoot out of anger. But Samantha reminds him that Oscar was angry at the police officer and that is what caused them to say they wanted to shoot a robot in the first place. Roux wants us to focus on the fact that they were laughing at the time and not shooting out of anger, I’m guessing to imply that it’s not as big of a deal to shoot a gun if you’re laughing at the time. Don’t you just love defense lawyers, they make some fancy justifications. Roux challenges her about whether or not she really remembers this event accurately because the next day, October 1, 2012, Oscar was in Scotland at an event. Samantha states that she doesn’t remember him going to Scotland the next day, but she does remember that both of their suitcases were in the car at the time. He asks her again if she slept over at his house that night and she states that perhaps she did not and maybe he dropped her off at home afterwards. But she does very clearly remember the shooting incident that happened earlier that day. Going back to Oscar’s bedroom, Roux wants to address which side of the bed that Oscar sleeps on. He asks her if she is aware that Oscar had an injured shoulder and was sleeping on the left side of the bed on the 12th and 13th of February, 2013. Samantha states she was not there that night so she would not know anything about that. He also asks her if she was aware that Oscar liked fresh air on his prosthetics at night. She does not recall that. Roux states that Oscar likes air on his legs at night. I’m guessing this will be the justification for getting up at 3am to bring fans inside the room. It will also be the justification for why Oscar’s gun holster was on the left side of the bed, not the right. Sounds like Roux will present some evidence about a shoulder injury later in trial during their presentation. He then asks Samantha if Oscar can walk well on his stumps. She said yes but he often needed to balance against something. Roux asks Samantha if Oscar was frequently afraid. Samantha says not necessarily. She is aware that he carried a gun around with him but she would not describe him as being afraid all the time. He asks her if she remembers in April 2012, that they were pursued by a white C class Mercedes and Oscar had to jump out of his car near the security gate where he lived out of fear. She says yes, she recalls an incident but that it was a black BMW that was following them. Roux tells her perhaps that was another incident, but go on and describe it anyway. She explains that when they arrived at Oscar’s estate, Oscar jumped out of the car and held his gun to the BMW’s window and the person drove away. He asked her if she was in fear (trying to ascertain why Oscar had to react that way) and she says no, I don’t recall being scared. Roux drops the discussion and moves on to the telephones. 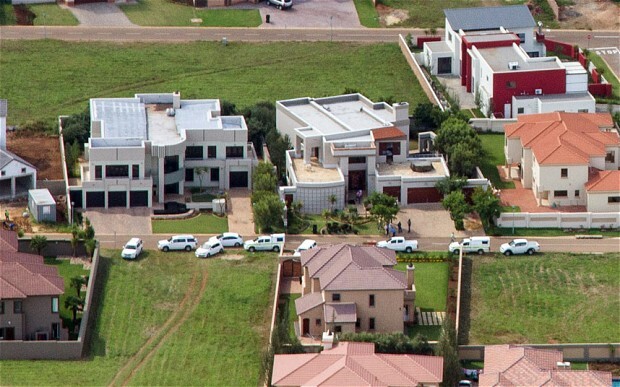 Interestingly enough, Oscar drives a white car (which can be seen on security footage at his estate – I’ll include that photo below.) So perhaps Samantha was correct, they were in the white car and the pursuing car was black. Roux does not seem to agree with her. Roux wants to know if Oscar always took his cell phones to bed with him at night. Samantha states that he would leave his work phone in the kitchen and would take the personal cell phone to bed with him at night. She said that wherever he went in the house, he took the phone with him including bathroom, kitchen, etc. The phone was always with him, he never left it alone. His phone charger was next to his bed, so she reiterates that the phone was with him next to the bed every night. The cell phones are an important piece to the puzzle, I believe. I am very interested to see Oscar and Reeva’s phone records for that night, as well as any data they retrieved from the units. Two cell phones were found in the bathroom that night just outside of the toilet room door (see the bathroom image above). It makes me wonder if Reeva had his phone in the bathroom with her and possibly discovered something that he didn’t want her to see. We’ll have to wait and find out what the State has on this. Very interesting that Oscar reportedly never left his phone alone. According to Roux, Oscar claims that when he is outside of his home sleeping at other places, he keeps his firearm next to his prosthetic legs. But in his own home he keeps his gun under the bed on the side where he is sleeping. Samantha states that she never witnessed him keeping his gun under his bed while they were a couple. Roux wants to know how Samantha felt about the break-up with Oscar this last time (in November 2012, when he started dating Reeva). She states she was upset. She then breaks down and cries again on the stand, and they take another short break. She clearly has raw emotions about him and one would imagine is probably freaked out by the fact that she dodged a bullet, literally. Of course I can’t confirm her emotions for sure, I’m just speculating. When they come back, Roux confronts her about two emails that she sent to Oscar admitting that she cheated on him and thus apologized. Samantha says she has never admitted to cheating on him, however she did admit in her emails her relationship with Quinton. She explains, she did not cheat on Oscar. She dated a man named Quinton after their first break up. She states she has emails to prove this. She traveled with Quinton van der Burgh to Dubai, and they did have a relationship. At the time, Oscar was over in London. She also made reference to an altercation that occurred because of this man, but did not bring up further details nor did the lawyers question her about that. They noticeably did not address the altercation, perhaps because it’s just not relevant to this case. I did find these details online about the altercation which happened back in 2012. NOTE: this was not entered in to trial evidence so I cannot confirm the legitimacy of these details, nor should it be used to help you form an opinion about the accused. They are back from break now and Roux says that he got clarification that Oscar was driving the black BMW and the car following was a white Mercedes. He says that Oscar phoned security on the way to the gate to inform them about possibly being followed. He jumped out of the car when they reached the gate and simply backed away from the car. Samantha says she doesn’t remember him phoning security. She remembers when they were driving down the road he noticed a car was following them. When they got to the gate he jumped out of his car and went to their window with his gun. Roux states that Oscar did not go up to the car but Samantha says that he did go up to the car. So it’s a classic he said, she said situation. In Roux’s conclusion he tells Samantha that Oscar denies that he shot a gun through an open sunroof of the car. Samantha states that she absolutely can remember that he did and it was on their way back from the Vaal River trip. Nel cross-examines. Samantha again recounts the situation where they were being followed. As they arrived at the main gate of his estate, he jumped out of the car and put his gun to that car’s window and the car then drove away. Nel asks Samantha if there was ever a time when she was at Oscar’s house that he thought an intruder was in the house. Samantha says yes, there was one occasion where something hit the bathroom window while they were sleeping. Oscar woke her up and asked her if she heard it. She said it must just be from the storm that they were having that night. He got up with his gun and walked out of the room. His friend Matthew who was staying at Oscar’s house at the time walked out of his room as well. 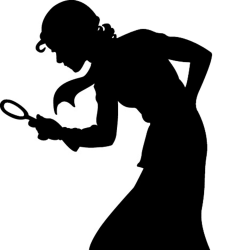 They investigated and that was that. She said there were one or two other occasions where Oscar woke her up and asked her if she heard anything. No further questions, Samantha is excused. Next witness is Pieter Baba. He is a shift leader and security guard at Silverwood Estates where Oscar lives. He had been working there for 2 years. There are typically 5 guards on for each shift. Whenever visitors come to see a resident, they take down their license plate information and the driver gives the guard their driver’s license and their state number. Security then phones the resident and requests permission to let the person enter. If they don’t get a hold of the owner then they will send the person away and not let them in. On the night of February 13, 2013, Baba was on duty at the gate. He knows Oscar Pistorius, he is one of their security clients. He also knew Reeva through Oscar. Baba saw Reeva at 6pm that night when she arrived at the gate. She was alone inside of her car. He spoke with her. 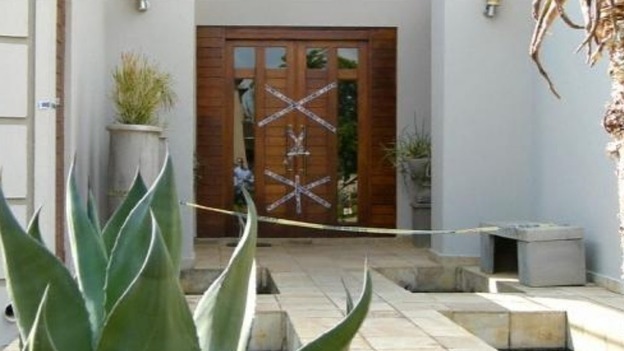 They did not phone Oscar’s house that night when she arrived because Reeva had already been there earlier that day. They opened the gate and let her in. Oscar arrived a few minutes after Reeva. Baba greeted Oscar and Oscar was on his cell phone at that time. 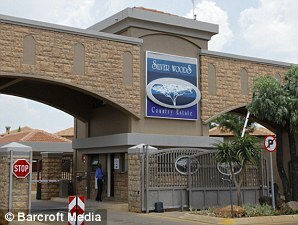 Below are images of the security gate and CCTV images of Reeva and Oscar arriving to the estate entrance on February 13. The main access gate is closed at 8pm in the evenings. And at 9pm all gates to the community are closed. Baba confirmed that security has a land line phone, as well as a site cell phone for when they are out on patrol. All the residents have both phone numbers. They arrived at Dr. Stipp house and he was out on the balcony. Dr. Stipp pointed directed at Oscar’s house and Oscar’s house lights were on so the guards immediately drove over there. Upon arrival at Oscar’s house, Baba called Oscar from outside of the home using the site cell phone. He spoke to Oscar who said “security, everything is fine”. That’s when he realized that Oscar was crying. Baba then said to the other guard who was driving that everything is NOT in order here as Oscar is telling me. I then tried to speak to Oscar to see if he could come downstairs just so he could make sure that everything was fine. That’s went the conversation ended. (I take that to mean Oscar hung up on him.) Oscar called him back and didn’t say anything but was just crying and the phone disconnected again. Baba thinks that Oscar may have dialed him back accidentally. Baba told the other guard again that something is wrong. At that time, Johan Stander and his daughter arrived in a blue mini cooper and they parked the car half way in to the street. Baba could see from the look on their faces that they knew something bad had happened. 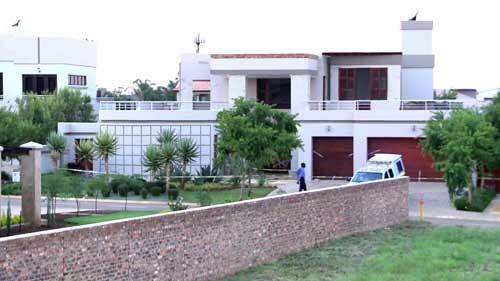 The Standers jumped out of their car and raced straight to Oscar’s house without saying a word to the guards. Baba and the other guard ran after them. When they were just about to reach the door, Oscar saw them standing outside. That is when Oscar then came down the stairs carrying Reeva in his arms. Baba was very shocked by what he was seeing that he couldn’t even think for a few moments. How could everything be “fine” when Oscar was carrying a woman down the stairs. When Mr. Stander said “Oscar”, Baba kind of snapped out of his shock. The Stander’s daughter (I believe – the interpreter was hard to understand here) was the one who opened the door and went inside and Mr. Stander was standing in the doorway. I got the impression from the way that Baba was testifying that the Standers were blocking the guards’ entrance. It seems to me that they were very aware that Oscar had a serious problem and wanted to be the first on the scene to deal with it. I don’t know what exactly that means, but I’m theorizing that perhaps Oscar wanted to deal with this in his own way, make it look like this horrible accident and try to keep it as quiet as possible. Remember, Dr. Stipp testified on Thursday that after he examined Reeva and was standing outside with the Standers that the daughter (or the wife, not sure which) made the comment “I hope this doesn’t get out to the public.” That is interesting to me. In the immediate moments after such a horrible event, the tragic loss of a loved one, the idea of Oscar or others being worried about how the public will perceive this is very disturbing. Baba, as he was snapping out of his shock, then noted that he wanted to see what type of clothing Oscar was wearing. Oddly enough, he never stated on stand what he was wearing. The lawyers never expanded on that at all. Nor did they address what Reeva was wearing, which is something that the public has been wanting to know for a long time. Was she in street clothes or pajamas? For some reason, neither lawyer addressed clothing at this time. Perhaps they are waiting for the police or medical examiner’s testimony to bring up those details. Seems to me, it would have been ideal to have Dr. Stipp testify as to what Oscar and Reeva were both wearing. He could have either confirmed (or contradicted) what the future witnesses will say about clothing. For some reason, neither Nel nor Roux asked Stipp about clothing either. At this point, according to Baba’s testimony, Mr. Stander told Baba to go call police and the ambulance. 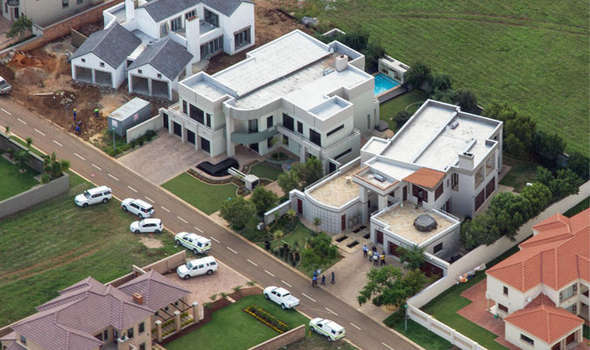 He also gave the guards instructions to make sure that no cars were parked at Oscar’s house. I’m not sure what that was about. Was it to make way for emergency personnel (which doesn’t really make sense, they could just park in the street right outside) or was it for some other reason? The lawyers did not expand on this either. Baba then left to go make the phone calls. He also called the control room office and informed the manager of what was happening. Baba never went in the house that night. He does confirm though that the lights were on inside the house. So the security guards never went in the house and police didn’t show up until after Dr. Stipp left. There was a good chunk of time that Oscar and his “people” had the house to themselves. Roux cross-examines Baba. Baba explains how they keep track of their patrols. There is a guard track outside of Oscar’s house that goes off every hour. They need to stop there to indicate their patrol otherwise the machine indicates “failed patrol”. Roux looks at the records for the guard track that night. At 2:20am the morning of February 14, 2013, the guard track was activated meaning that the guards did patrol that area. 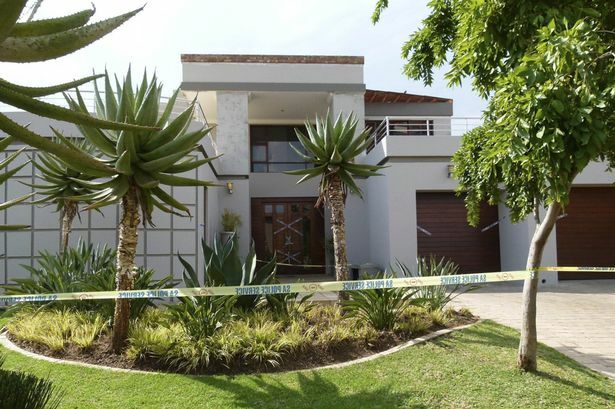 According to the statement of the guard on that patrol, everything was normal outside of Oscar’s home at 2:20am. Baba states that during this 3:15:51am phone call to Dr. Stipp, he was told by Dr. Stipp that gunshots were heard coming from his neighbors. Dr. Stipp wanted them to come see what was going on. There was another call from another neighbor at 3:16:15am, which initially didn’t go through, but did successfully get through at 3:16:36am. It lasted for 44 seconds. This additional neighbor also reported shots heard. Roux also stated that Oscar made a call to the security cell number at 3:21:33am. Baba suggests that this must be the time that Oscar called him back and was only crying (the call when he assumes that Oscar accidentally dialed him back). No words were spoken by Oscar during that call. Roux then tells Baba that the call that he made to Oscar was at 3:24am. So he is trying to say that Oscar called Baba first, not the other way around. Roux is fumbling with papers at this point. He states he needs to get these records in order for the court and wants to address them further on Monday. On February 14, 2013, at 1pm, Baba made a statement to the police. He states that he told the police that Oscar said to him “security, everything is fine.” Roux wants to know if Baba can think about the conversation again and is it possible that Oscar responded that “he was fine”? Mr. Barber states no… he remembers very clearly that Oscar said exactly “security, everything is fine”. Baba does reconfirm that Oscar was crying at the time. They adjourn for the weekend. why did this guard who heard the rifle shots not take the stand? Don’t know. One of the most frustrating things about following trials is that there is always more than we’ll ever know. I can appreciate your thoughts here but have to somewhat disagree. It was testified to that the tiles on the wall to the left of the door came off when the door frame was hit with the cricket bat. The vibration caused it. Chances are, Nel did not challenge that because it could very well be the cause of those tiles falling. As for the metal plate, the State’s experts testified that they could not determine what caused the damage therefore there is no reason to ask Oscar. He can give them any answer he wants and it would be difficult for the State to refute it. It may be the same case with the jeans outside. They may be able to make an inference but if they truly don’t know why they are there, it’s a slippery slope to confront the accused who can then give any reason he wants. The one area that I am in agreement with you is the bedroom door. Oscar’s story about kicking the door to undo the lock was ridiculous. I would have liked to see him challenge that. Since he didn’t, I’m not quite sure what/if he can say about it in closing. And for the order of witnesses.. There usually are behind the scenes reasons why prosecutors call them when they do. Not sure why Nel chose the order, but I didn’t necessarily see any problems with it. The 2am argument – the security guards very well may not have heard it as Mrs VDM said it was intermittent. Maybe at the moment they walked by, the argument had quieted down. That’s possible. You do bring up an interesting point about them not seeing OP’s balcony door open but perhaps since it doesn’t face the Main Street (it faces the neighbors house) it was not detected. Where does the testimony of the jeans outside the bathroom window come in? I’ve watched the whole trial and can’t say I remember anybody testifying that there were jeans outside… not even the police who examined the scene. Day 11 / Van Staden’s testimony – the State included the photo in evidence submitted to the court, but there was no discussion about it, nor did Nel ever ask OP about it while he was on the stand. You can view a pic of the jeans in my Day 11 post.